Day 01: Neemrana: Welcome to India. You will be received at New Delhi International airport, assisted and transferred straight to Neemrana. Stay in the fascinating Neemrana Fort. Day 02: Neemrana: Day free to explore around the village. Besides the fort, a step well is also worth exploring. Day 03: Samode: Drive to Samode village and check in at Samode Palace. The fairytale palace perfectly recreates the nostalgia of its princely past when every aspect of it evoked a unique style! Day 04: Nawalgarh: Reaching the Shekhawati heartland, take a walking guided tour of the colorful town which has some of the best preserved frescoed "havelis" (mansions). 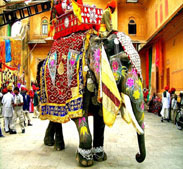 Day 05: Nawalgarh: The day's activity includes a traditional Rajasthani lunch and an excursion to nearby towns of Lachhmangarh and Fatehpur for the better appreciation of the Shekhawati region popularly known as 'the largest open air art gallery of the world'! Day 06: Bikaner: Reach the 'Camel City' Bikaner and check in. After a brief leisure, visit the well-preserved Junagarh fort. In the evening visit the unique camel-breeding farm. Day 07: Jaisalmer: Drive through the Thar Desert and finally reach Jaisalmer (the Golden City) and check in at your hotel. In the evening walk in the still inhabited fort of Jaisalmer abuzz with a distinct and vibrant lifestyle. Day 08: Jaisalmer: Morning sightseeing tour of the fort and various other attractions of this fairytale city. In the evening, excursion to the Sand Dunes of Samm for the sunset view of the desert. Take an enjoying camel ride on the desert. Day 09: Rohet: Transfer to Rohetgarh. Take a less popular route and reach Kheechan village for the rare sight of thousands of migratory birds in the desert.Drive further and visit the ancient town of Osiyan on the way. Finally reach Rohetgarh Palace (a charming heritage hotel) and check in. Day completely free to move around the village of Bishnoi community. Day 10: Rohet: In the morning take an excursion to Jodhpur and visit Mehrangarh fort, Umaid Bhawan Palace, Sardar Market and Old Town. Back at Rohet evening free on your own. Day 11: Udaipur: Drive through forested and tribal areas of Aravalli ranges and visit superb Ranakpur Jain temples on the way. At Udaipur check in your hotel. Remaining day at leisure. Day 12: Udaipur: After breakfast move out for a half day sightseeing trip of City Palace and Saheliyon ki Bari. Rest of the time free to explore the interesting labyrinths around Jagdish temple on your own. Take a boatride sightseeing tour of Lake Pichhola at sunset. Day 13: Dungarpur: Transfer to Dungarpur. Arrive and check in Udai Bilas Palace- a beautiful lonely palace. Later visit Juna Mahal having stunning interiors with a series of colorfully painted chambers. Day 14: Dungarpur: The whole day free to relax in the serenity of Udai Bilas Palace. Day 15: Deogarh: After a leisurely breakfast, drive towards Deogarh visiting Eklingji and Nagda on the way before finally checking in. Stay in Deogarh Mahal - a palace of great character and ambience. Day 16: Deogarh: The whole day on your discretion. Suggested visit to Molela village (famous for terracotta crafts) or Kumbhalgarh Fort. Option of taking a unique safari on horses to the villages in this region of rugged terrain. Day 17: Jaipur: Transfer to the Pink City - Jaipur. On arrival check in the hotel. Evening free to walk in interesting old bazaars. Day 18: Jaipur: After breakfast move out for a sightseeing tour of the City Palace Complex, Jantar Mantar and Amber Fort. Evening at discretion to try one among several options - shopping, visit a farmhouse for local Rajasthani dinner or taking a walk through the streets lined with great heritage buildings. Day 19: Agra: Drive to Agra en route visiting Fatehpur Sikri - the abandoned citadel of Mughal Emperor Akbar. Finally reach Agra and check in. Remaining day at leisure. Day 20: New Delhi: After breakfast proceed for sightseeing tour of Agra which includes the most beautiful monument of love - The Taj, Agra Fort and few other attractions. Later checkout from the hotel and transfer to New Delhi. Arrive and check in. Remaining day free for shopping at Hauz Khas Village or at leisure. Day 21: New Delhi: After a leisurely breakfast move out for a daylong sightseeing of Old Delhi (Shahajahanbad) which includes the Red Fort, Chandni Chowk & Jama Masjid along with other attractions. Drive past the impressive boulevards and buildings such as President's Residence and others in Lutyen's Delhi (New Delhi). Evening free to move around the busy Connaught Place. Day 22: Departure: At appropriate time checkout from the hotel and transfer to International airport to board the flight back to your country (Tour Ends).